Not surprisingly then, Silvermoon was the first faction that I invested in. The Silvermoon Syndicate are the mafia/yakuza equivalent in the Bushido universe. At the top of the heap are the crime bosses and and then below that their various underlings: advisors, warriors and enforcers, animal trainers, big buto "heavies", street urchins, manipulative "roses" and more. As with most Bushido factions, you can easily focus on one side of the faction or another. As a painter, tattooing the big buto had an instant appeal, so I gravitated towards those models and have had a lot of fun with them. However, the other set of Silvermoon miniatures that caught my eye were the non-combative "old men" of the faction, so that's what this post is about. Before getting into the individuals themselves, what is it that so appeals about this side of the Silvermoon? Well, speaking to my painting side again, one of the big appeals for me was a chance to get away from the in-your-face muscle-bound, axe-wielding, machine-gun-toting, subtlety-avoiding, much-hyphenated stylings of most miniatures that I mentioned above. 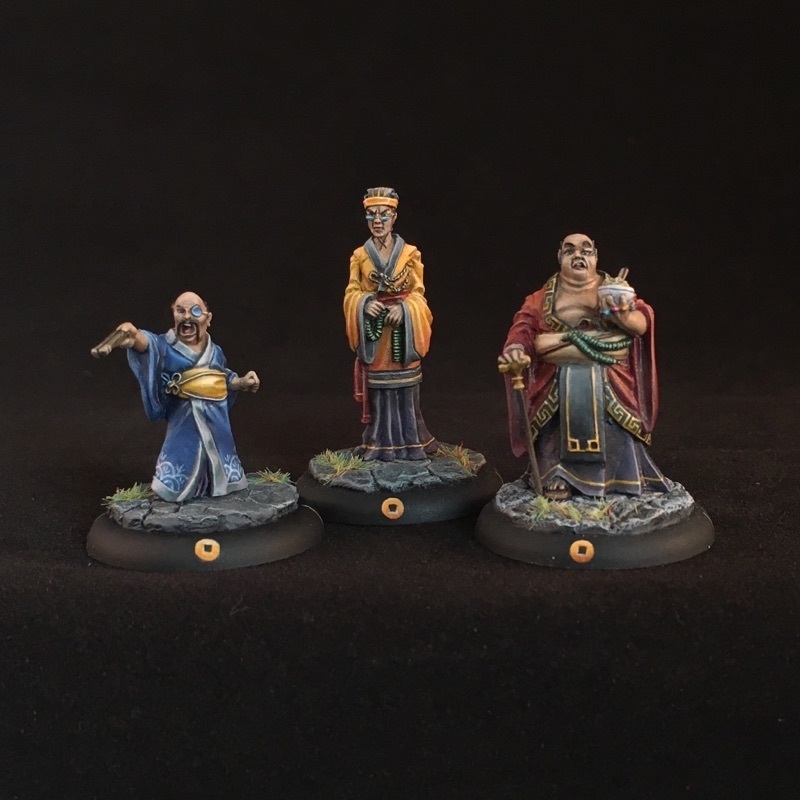 But in addition to having the chance to paint something different was what the inclusion of these minis said about the game of Bushido itself. Seeing Harukichi in Silvermoon's starter set really communicated that Bushido is not all about fighting and beating down your opponent. Before even delving into the rules, it got me excited for a game that was promising (and indeed delivers) great tactical depth where large fists and broadswords are not always the path to victory. The starter set contains the first of the old men that I've painted for my Silvermoon warband, Harukichi. Arrogance and haughtiness are just oozing out of this miniature. In-game, he's the tactical genius behind Silvermoon, able to get away with such arrogance because he is able to control the flow of the game, enabling the Silvermoon player to re-roll poor dice in order to gain a better result... all while hiding within the large protective shadow of big Manu, his bodyguard. 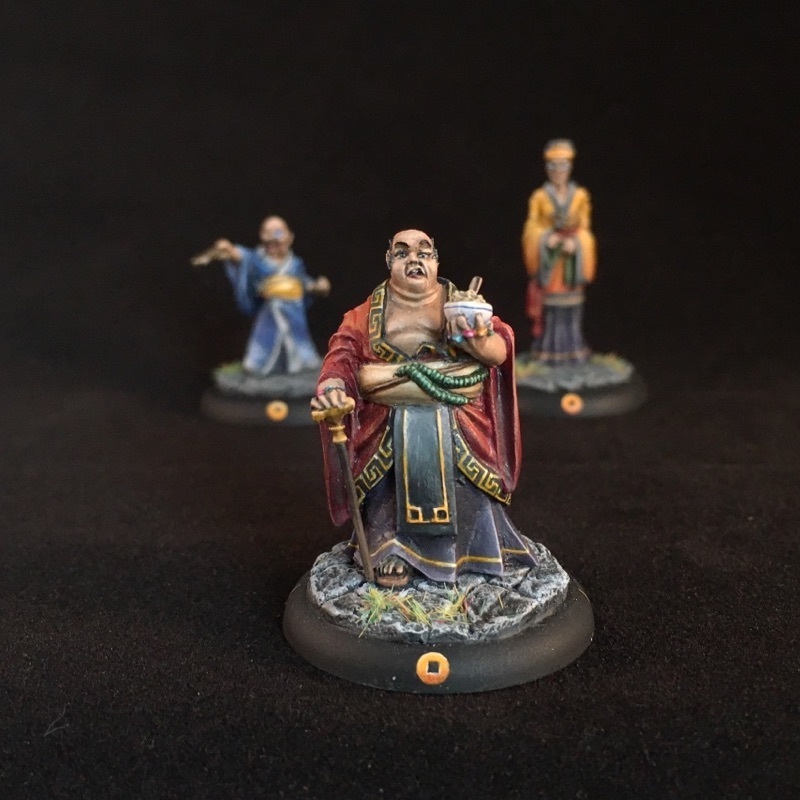 Harukichi was actually the second Bushido miniature I painted after Manu. With Manu, I challenged myself to try out some freehand work (something I'd never really done before) by painting his tattoos. I was pleased with the success of those and so wanted to do something similar with Harukichi. Rather than tattoos, however, I thought I'd paint a pattern trim on his robe. So after some planning on paper, I worked out the rectangular twisting pattern and plotted it out all around his robe. One thing I found particularly helpful with this pattern, and a technique I've repeated on other repeating patterns on my Silvermoon minis, is to start by placing a series of dots at the key intersections of the pattern. Unfortunately I don't have any pictures to demonstrate this, but by starting with simple repeating dots, it made it easier to keep the pattern regular as it was easy to see that each dot was the same distance from the other dots. Then, once that was done I went around connecting the dots and filling in the gaps in the pattern. Actually playing with Harukichi on the table is a lot of fun. His first advantage becomes clear with one of the first rolls of the game: the tactical roll to decide who goes first. With his Tactician(1) skill, Harukichi allows you to roll an extra die, doubling your chances of being able to go first (if that's what you need) each turn. It's not usually an issue on the first turn, but with each new turn, there's almost always something that feels crucial to execute before your opponent can stop you so having an advantage here is very helpful. Once you're past the the tactical roll on turn one, my strategy is usually to have Harukichi Focus. This is a complex action, but allows him to generate ki again, giving him a nice reserve come turn two. On turn two, he can then usually run to catch up with the rest of the warband... or at least within good range for him to trigger his "Fortune's Favour" ki feat. "Fortune's Favour" is at the heart of what makes Harukichi so great and as long as he is standing on the table (after turn one), he should have this ki feat active. This provides an 8" aura around Harukichi within which you can then opt to spend ki to re-roll any crucial dice rolls. You do have to spend a ki token for each die you want to re-roll, gambling on whether you'll need the re-roll or not. However, while it may hurt to spend a ki or two only to roll all fives and sixes in a melee... it's far better than being stingy then rolling all ones! As you're going to want to be using Harukichi's ki for all these re-rolls, it's helpful to keep him back out of combat (preferably within 2" of Manu who can jump to his aid as his bodyguard) and either Focusing each turn to keep his stash of ki high, or able to dart out and maybe capture an unattended objective if necessary. An 8" aura is also pretty wide, but be careful not to get him pinned in on one side of the table, out of range and unable to share his good fortune with someone who might need it on the other side of the table. After the starter set, the next miniature I picked up was Old Zo, wizened old advisor to the syndicate. Unlike hefty Harukichi who won't even put down his rice bowl to join the battle, Zo is a gaunt beanpole of a mini. However, it will probably come as no surprise that this simple miniature requires absolutely no assembly! But, simple as it is, it is a lovely little sculpt. While Harukichi's face has a perfect sneer, Old Zo clutches at his beads and peers over his spectacles with a measurable distaste for whatever his is witnessing. I'd already determined that I wanted a golden orange/yellow color to be a subtle through-line throughout my Silvermoon warband. Manu, Senpu and Wasupu all had yellow trim on their gi or robes, Tsubaki's fans were a sunset orange/yellow and Harukichi's trim was all decorated with the same hues. For Zo, though, I felt I could go all out and painted his main robe with a full fade from yellow down to orange. His lower robes I then painted in the same dark purples as Harukichi's. I quite liked the brightness and simplicity of this, so opted to forego any freehand work on Zo - a simpler (but hopefully still characterful) paint job for a simpler mini. Now, in a pinch, Harukichi can still defend himself. He's no natural born warrior with just 2 melee skill, rolling two dice in defense will still keep ol' rice-chops alive until one of the more able Silvermoon enforcers can arrive to bail him out of danger. With his more advanced years, however, Old Zo arrives on the table with only 1 melee skill. So, you're not going to want to throw him into the fray. However, like Harukichi, Zo has a certain aura about him... in his case, he doesn't manipulate luck, but ki. Like Harukichi, you're probably going to want to Focus Zo on turn one, then run him up behind the battle-line so he can raise his "Tax" aura. I try to kick it off with 2 ki so that it has an 8" range like Harukichi's aura. Once in place, any enemy model that attempts to use his ki, either for a ki feat or to boost their melee dice, will discover that their feats are suddenly 1 ki more expensive! Now, that's pretty nice in and of itself... but it gets better: that extra ki then goes to Old Zo, added to his ki pool. Often, your opponent will be frustrated by this, but still continue to spend ki as before, allowing you to accumulate a nice stack of ki tokens on Old Zo. However, the other possibility is that your opponent decides that boosting is just a little too expensive, or it's not worth Zo getting the extra ki just to pull off that ki feat they were planning. However, that's not so bad either -- Zo acts as a dampening force on your opponent, causing them to think twice before they use their ki to their advantage. Once Zo is sitting on a nice little stockpile of ki, you will probably then want to invoke his other feat: "Trade". This allows him to then channel that ki over to someone else on the battlefield (maybe Harukichi?) who can make good use of it. His Trade skill also gives him Leech, so even if Zo himself hasn't been able to accumulate a hoard of ki, he can take it from one of your models who has more than they need and then channel it to another who can make better use. As each of these skills has an 8" range, you can conceivably move ki tokens up to 16" across the battlefield, surprising your opponent. Maybe they thought they had the upper hand on Fitiaumua, but then suddenly Zo delivers him a nice chunk of ki, enabling him to boost his melee skill and deliver a killing blow.... and Zo gets the assist. This diminutive "oyabun" is the most recent old man to join my Silvermoon warband. After having experimented with several different lists, I wanted to try out one of the special "themes", the Iron Fist Gumi. 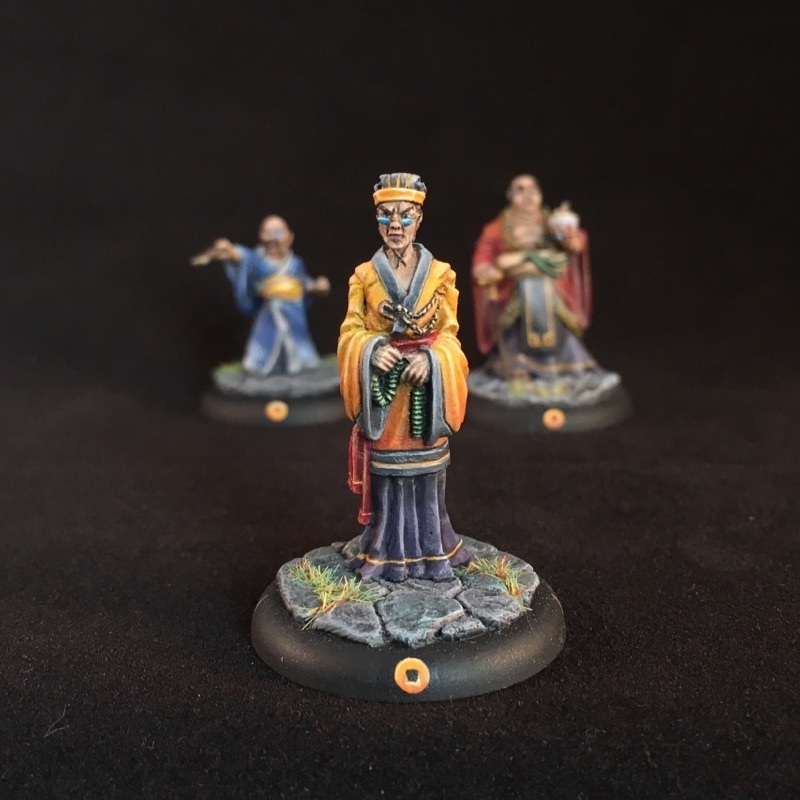 In Bushido, a theme is a special grouping of models within a given faction. Building a list based on a theme restricts you to only certain models, but also grants you several bonuses. In the Silvermoon Syndicate, the Iron Fist Gumi theme focuses on the big buto. I already owned Manu and Fitiaumua, so with the addition of Oda and his big pal Tautola, it seemed like a fun way to throw a lot of big heavies on the table. Oda fits in perfectly with this theme. His role is that of "jumo sensei"... or big-fella-trainer. He comes in a pack with Tautola, another big buto, and can be played independently or riding on Tautola's back. While I built the two models so that Tautola's backpack could be easily detached, and Oda has a concealed magnet embedded at his feet so he can either be magnetized to the backpack or to his own cobblestone base, I prefer the two models standing on their own: both how they play in game and how they look. While my reasons for picking up Oda were a bit different than Harukichi and Old Zo as I bought him for his utility in game rather than specifically because I like the miniature, that doesn't mean that I don't like his model. Quite the opposite: he easily has as much character, if not more, than Harukichi! Likely suffering from a Napoleon-complex, he's a short little fella, but he clearly makes up for it in attitude! He's gesticulating madly with a closed fan and has his mouth wide open, yelling at some underperforming buto while keeping his monocle firmly in place. As I'd painted Harukichi red and Old Zo yellow/orange, I wanted to keep up the colorful array of robes and decided to paint Oda in blue, with a yellow sash to carry on the yellow theme mentioned above. 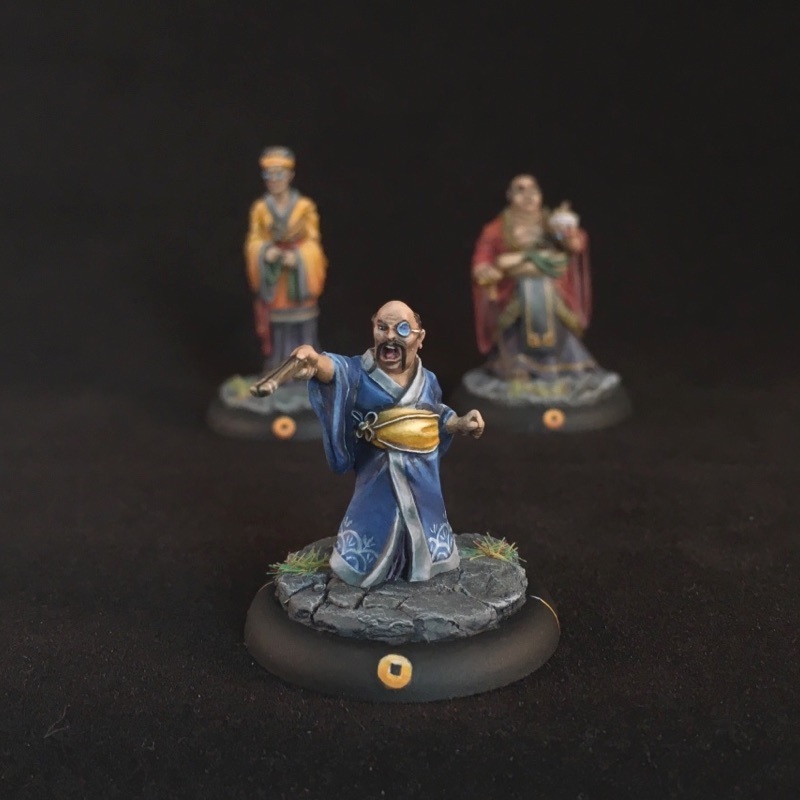 One of the things that I love about the Bushido miniatures, Silvermoon in particular, is that there is a lovely balance of detail and simplicity. Oda's face is wonderfully complex, with the moustache, yelling mouth and monocle. But his robes are clean and simple and just calling out for another bit of freehand work to detail them. For this, I added another repeating pattern around the base of his robes in white. As before, I started with a series of dots, then joined them up with curves to make the full pattern. In game, Oda's another miniature (not surprisingly) that you want to keep out of combat. This is partly due to his lack of melee skill, 1 just like Old Zo, but also because of his Order(2/Buto/6) ability. What that means is that, for a complex action (spending both of his activations), Oda can give 2 Buto within 6 inches another activation. If they're tired, they become rested; if exhausted they become tired again. This is a tremendously useful ability and can be used in a number of ways. The most obvious is to simply give the buto another round of melee against an opponent - likely their opponent is now exhausted if they've already fought two rounds of combat, giving the buto a dice advantage. However, it can be a terrible surprise to survive someone like Tautolo charging into combat, exhausting him, thinking you're safe as he's out of activations, only to have Oda Order him back to a tired state and watch him pound on you with that big club of his one more time! But I've also used it to gain that one crucial extra activation required to allow a buto to pray at an idol to eek out a victory point. If Oda is stuck in combat, he can't use Order (as he must instead melee) and so you lose this tremendous ability of his. (Incidentally, this is one of the reasons I prefer to keep Oda independent, rather than riding on Tautola's back: I want Tautola in combat, and Oda out of it!). The other of Oda's abilities that's worth using as frequently as possible is his Jumo Sensei ki feat. With this ki feat he is able to spur on another model with a "Jumo instruction token". This can provide one of a variety of extra combat abilities to that model, or allow them to use one of their existing abilities at a reduced cost (almost always making it free). With models like Tautola around who has Powerful Attack or maybe Dakufaia and his Slam Attack nearby, giving them that extra combat boost at no cost can conceivably turn the combat in your favor, or result in a devastating attack to end a melee quickly. This is amplified further with the Iron Fist Gumi theme as that theme also allows you to give out an additional one of those tokens every turn, even without Oda. In most miniatures games, support characters don't always get the glory. They're not the biggest, like Tautola, the toughest, like Manu, nor are they flaming (literally) melee monsters like Dakufaia. However, in a game like Bushido where so often just stomping on your opponent can be a waste of activations and having a warband made up purely of fighters is not at all a guaranteed winning approach, the support characters like this trio of models really come into their own. As they're all also a thorough pleasure to paint with personality in spades, I can highly recommend the "old men" of the Silvermoon Syndicate. So, I'm always forgetting to append this to my blog posts, but if you enjoy this, perhaps you'd consider following me on Twitter or Instagram. I post there far more frequently than I do here, both finished miniatures but also work in progress shots. Thanks!